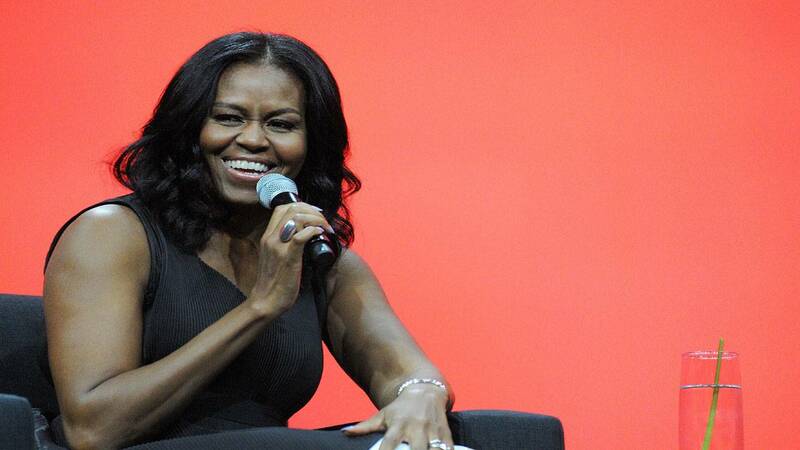 WASHINGTON (CNN) - In her first major speech since leaving office, former first lady Michelle Obama made an impassioned argument for the importance of educators in communities across the country, saying the example they set is "what makes America great." Without naming President Donald Trump, Obama subtly acknowledged his effect on children and nodded to the "anxiety" in political discourse caused by his behavior. "Our counselors and educators have a far bigger impact on our kids' lives than any president or first lady. ... You all serve as living, breathing examples of the kind of people they should aspire to be," she said, speaking at the School Counselor of the Year ceremony at the Kennedy Center, a collaboration between the American School Counselor Association and part of her Reach Higher initiative on higher education she spearheaded as first lady. "And trust me, I know this work isn't easy, especially right now. I know there's a lot of anxiety out there. And there's no denying that our kids, what they see on TV, the kind of behavior being modeled in public life -- all of that, yes -- impacts their behavior and their character," Obama said. "But at times like this the work you are all doing is even more urgent. It's even more critically important. See, you all have the power to teach our kids what it means to go high when others go low. You have that power." The former first lady told the counselors the "real work" of making change happens on the ground in classrooms and communities. "Folks like these up here, you all, you don't get dragged down by the headlines, by the false claims about our children and our neighborhoods, you don't have time for that nonsense because you're out there doing the work," Obama said. She added: "No matter what's going on right now, out there, all that noise, you know that our young people are the future, and the most important thing we can do as individuals and as a nation is to believe in all of them, to invest in all of them and to build schools and communities worthy of their boundless promise." Last year, the 2017 School Counselor of the Year event was Obama's final White House speech, tinged with emotional remarks. "While it was nice to hold this event in the White House last year, this was never about the White House. It was never about me or Barack, and it's never about the handful of people who happen to be in power at any given time," she said Friday, adding, "Folks who model decency and dignity and integrity for our kids every single day, see, that's who we are. That more than anything is what shapes our children and that's what makes America great." Though she has maintained a low profile over the last year, adjusting to life in Washington beyond the White House, Obama has continued her work with the Reach Higher initiative she spearheaded as first lady, surprising students at Washington, DC, public schools, celebrating college signing day in New York City, and meeting with rising first-year college students. On Thursday, she made her first televised appearance since leaving office on "The Ellen Show," dishing on her post-White House life and making an appeal for empathy. "We have to be an open-hearted nation, and that's who we are. And that's the truth of who we are. We can't lose sight of that. So, let's just keep living our lives like that every single day and forget what they're saying in Washington," she said in the interview.